The author has composed his letter quite well and has refined hand writing. He mentions filling in for an orderly during his absence from the regiment and also carrying dispatches. This leads me to believe the author was a clerk or otherwise engaged in a profession that required good penmanship before the war. The first eight companies of the 2nd New York Heavy artillery left the State November 7, 1861; Company L December 2d; and Companies I, K and M December 12, 1861; and the regiment (except first Company L for which see 34th Battery) served at and near Washington, D. C., in the Military District of Washington, from March, 1862; in Sturgis’ Brigade, Military District of Washington, from May, 1862; in the Reserve Corps, Army of Virginia, from June, 1862; in the defenses of Washington, from September, 1862; in the artillery defenses of Alexandria, from January, 1863; and in the 22d Corps from February, 1863; in Tyler’s Artillery Division, 2d Corps, Army of Potomac, from May 18, 1864; in the 2d Brigade, 1st Division, 2d Corps, from May 29, 1864; in the 1st Brigade, 1st Division, 2d Corps, from July, 1864; in the 1st Brigade, DeRussy’s Division, 22d Corps, from June, 1865, as heavy artillery and infantry. September 29, 1865, commanded by Col. Joseph N. G. Whistler, it was honorably discharged and mustered out at Washington, D. C.
I received your letter yesterday and was very glad to hear from you for I had begun to think you had forgotten me. Ever since I wrote, we have been pretty busy drilling from five to seven hours every day and you may believe the sun does not spare me for I am getting as black as an Egyptian. But I do not think I am any the worse for it. The boys all say I have grown both tall and broad a considerable since I have been in Virginia. Since I last wrote we [have been] having some grand times here. The place where we are encamped is a large level field with as many as 200 acres of land in it and within the last week there has been three Grand Reviews of soldiers on it. The first day there were 40,000. The second there were thirty thousand, and the third there were as many as seventy-five thousand solsiers — infantry, artillery, and cavalry. There was General McClellan, McDowell, King, McCall, Harney, Barry, and Williams, besides Lord Lyons, ² and as many as a dozen congressmen. I saw them all and some of them are fine-looking, you may believe. Our colonels (for we have one — and a good one too — by the name of [Gustave] Wa[a]gner, a Hungarian). [Our] orderly was sick for three or four days and I had to act in his place. While doing so, I had to go to Gen. Harney’s headquarters with a dispatch. While I was there, McClellan and McDowell came in and I had a good view of them. 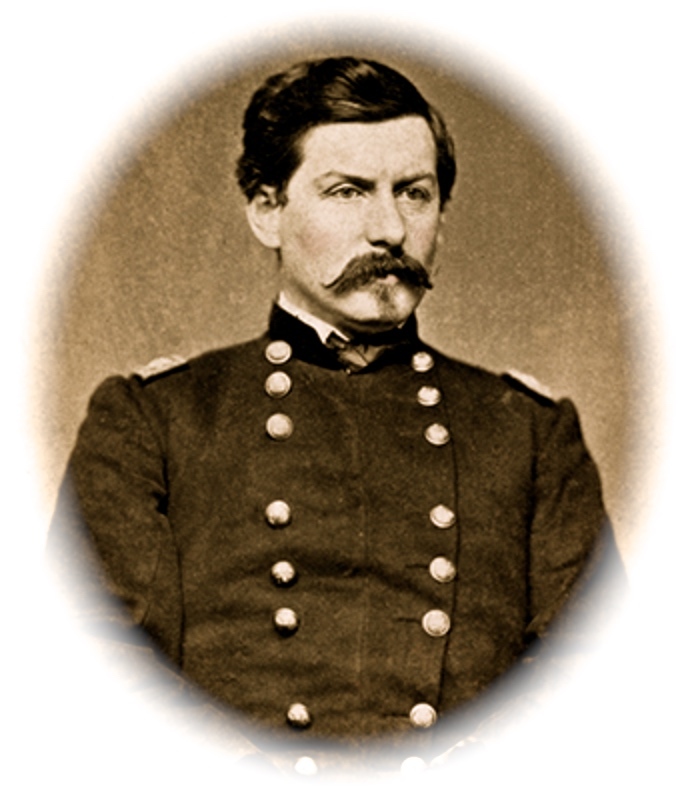 McClellan is not as tall as I supposed he was and his hair is not as dark. Tell Sophie he made me think of Napoleon. But after all, Gen. Harney is the man for me. He has got the best brigade and the handsomest horses this side of the Potomac. Col. [Jeremiah] Palmer of our regiment has resigned and we have a first best Colonel now, or at least he ought to be, for he has served twenty-three years in public service and been in 17 battles. He was in the Revolution of 1848 with Kossuth. But Mother, I must stop for it is time for parade. Mary is well and Mr. Jones is better and I am first rate. ² Lord Lyons was the British envoy to the United States in 1862.